I have brief glimpses of the land as cow pasture, a moment's memory of the dirt-floored hut with horse feed and building tools that was the only roof on the property, my sleeping bag upon packed red clay. Thus began the La Paloma Lodge project. The view was, even then, magnificent, but the land had been devoured and destroyed, left bereft of all vegetation except a few hardy weeds and bushes. Dad began the lodge with the clubhouse, his dream of kicking back with good friends and a few beers after a day of fishing at Cano Island. The clubhouse was finished (minus the stairs, at that point we pulled ourselves into the building from the ground four or five feet beneath) in 1986 with the thatch roof true to our logo, and then, while we kids explored the river and raced horses across the beach, construction began on cabins 1-3. Although today we have a staff over thirty people, the work in those days was shared between just ten. Most of those people were seeing electricity (with the help of a small generator) for the first time. My Dad did most of the architectural design and set-up. Mom worked on the landscaping and home-schooled her rambunctious brood. Our family moved into Rancho 3 in 1988. Mom, loaded down with school books for three different age groups, and Dad, ready to make the last minute adjustments to transform La Paloma Lodge (at that time Drake Bay Lodge) into a gateway for the avid sport fisherman. After the fishing boat sunk on its way up the coast from Panama with Dad and my grandfather aboard (a story in itself) , Mom had the good sense to notice the environmental treasure we had; the gears shifted and guidebooks began taking note of La Paloma, an eco-lodge nested atop a hilltop in beautiful Drake Bay. It is difficult to imagine Drake Bay without La Paloma Lodge. Sue Kalmbach and her late husband Mike, the founders of La Paloma, built this beautiful lodge from the ground up. They overcame the immense challenges of building on a site with no running water, no road access and no electricity while at the same time raising and home schooling their three children. With their manager, Nichole DuPont, what they have achieved is nothing short of spectacular. They provide visitors from all over the world access to the pristine rainforests of the Osa Peninsula with a sublime combination of comfort and luxury. When I was fresh out of university, it was with the Kalmbach family’s encouragement and support that The Night Tour took wing. We soon discovered the forest around the lodge is home to some of the most incredible night-time creatures on the planet. Over the past twenty years, this stunning diversity has attracted the attention of some of the most talented natural history film makers. Through the generous support of La Paloma Lodge, we have been able to showcase these extraordinary treasures through collaborations with the BBC, Discovery Channel, and Animal Planet, among others. These collaborations would not have been possible without their help and amazing hospitality. Today, La Paloma Lodge continues to shine a light on this special place we all cherish by supporting research and community outreach programs. In May of 2018, La Paloma hosted the very first study to catalogue the arachnids of Drake Bay, as well as a community-based workshop. The result of their efforts has contributed to the discovery of numerous new species for Costa Rica. For their commitment to fostering a greater understanding of the wildlife of the Osa Peninsula, Gian and I give our sincerest thanks. 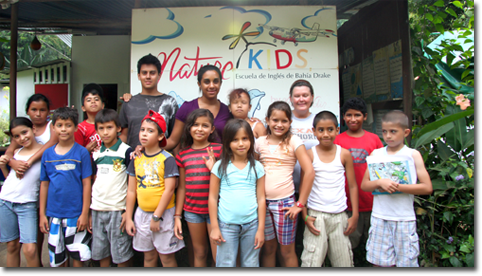 For almost thirty years La Paloma Lodge has strived to be a leader in the community of Drake Bay. From organizing and running fund-raising projects such as designing and selling T shirts and note cards, to starting a local school library, and providing fans for the classrooms, we have encouraged education as a way to promote a strong and healthy town. Living in a remote area, you can't wait for the local government to start or complete projects. La Paloma Lodge and other community leaders in Drake Bay bought the land for the new medical clinic, remodeled the police station, helped build and maintain the bridge and the nearby trails. One of our fundamental missions is to maintain the pristine habitat in Drake Bay. We support local private reserves, the turtle conservation project, the National Park and Isla Reserve clean up projects and the Corcovado Foundation. The original La Paloma property was a cow pasture when purchased in the 1980s. To visit today is to see how conscious planting can regrow rain forest habitat. We have been involved in reforestation efforts not only on the 24 acres of La Paloma Lodge property, but also around the local school. We are committed to maintaining viable animal corridors. Toward that goal, we are currently involved in efforts to keep motorized vehicles out of pristine areas that are currently in use not only by humans on foot, but also by elusive wild cats and other species threatened by loss of habitat. When we came to Costa Rica in the early 1980s, there were no plastic bottles, no disposable diapers and very few plastic bags. You purchased your meat, chicken or fish and it was wrapped in newspaper. You carried it home in the bag you brought. At La Paloma Lodge, we strive for that kind of simplicity and ecological sustainability. La Paloma Lodge uses recyclable glass bottles for sodas and beer. We have a reverse osmosis system and buy no plastic water bottles. We are members of an organization (Catuosa) working toward the elimination of single-use plastic. We also have the first electric car in the area. Much of our food waste is collected by a local pig farmer; we have a food composting system for all that remains. Discover the magic of Corcovado, visit Caño Island & immerse yourself in the serene tranquility of La Paloma Lodge.